Fiona Davidson (born Fiona Watt) has had a long and versatile athletics career. At fifteen years of age, her events ranged from 100m to 400m Hurdles. Until 1992 Fiona concentrated on 100H as well as 400H. Then in 1993, Long and Triple Jumps make an appearance. Within a year she was ranked third in Scotland for Triple Jump; and in 1995 reached a peak when she won the Scottish Indoor Triple Jump title with 12 metres 15 centimetres – which is still 14th on the Scottish All-Time TJ rankings. In all, indoors and outdoors, in Scottish Senior Triple Jump Championships, Fiona has won one gold medal plus three silver and one bronze. After marrying Aberdeen AAC’s 1990 Commonwealth Games 400H athlete and Scottish Champion Mark Davidson, (who was the 2014 British Masters Indoors M45 200m Champion), Fiona competed less frequently but, in 2001 and 2004, was still ranked 5th best Triple Jumper in Scotland. 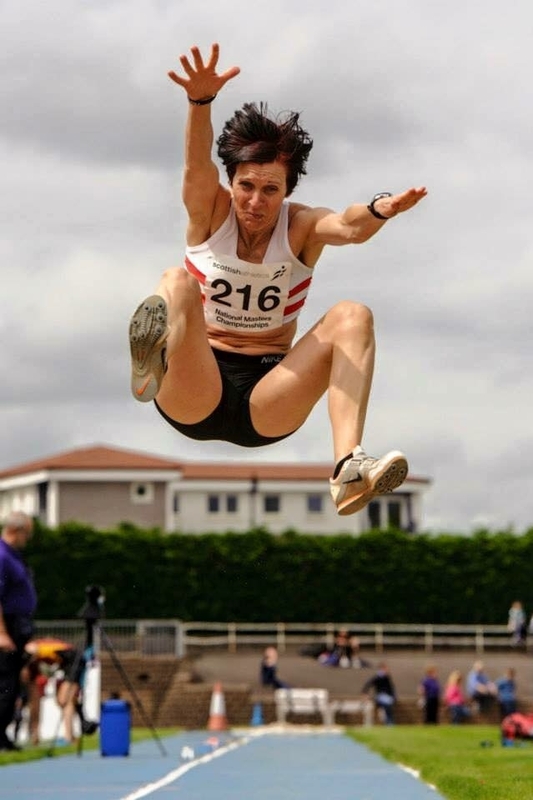 Having reached the W35 age group, Fiona Davidson quickly secured victory in the 2008 Scottish Masters Long Jump and Triple Jump, both Indoors and Outdoors. She repeated this feat in 2010, adding the 60 metres Indoors and also finishing a meritorious fourth in the Scottish Senior Championship TJ. In 2011 Fiona won even more Scottish Masters titles: Indoors 60m, LJ, TJ and Shot Putt, plus a gold medal in the Scottish Universities Triple Jump. 2012 to 2015 saw a considerable increase in competing. Highlights included victories in: several more Scottish Masters LJ and TJ; British Masters TJ wins in 2012 and 2013; a British Masters W40 Indoors LJ and TJ double in 2014, plus third in the Budapest World Masters TJ. 2015 has been extra special for Fiona Davidson. Scottish Masters titles plus silver (TJ) and bronze (LJ) in the European Masters Indoors in Poland. Then, in Lyon on 15th August 2015, a gold medal in the World Masters Triple Jump, with a distance of 11.35m. Long may similar successes continue for this exceptional, dedicated, resilient athlete! HOW DID YOU GET INVOLVED IN THE SPORT? I was always winning the school sports day at primary school so my mum suggested going along to the local athletics club. I went along to Coatbridge outdoor sports centre to train with Shettleston Harriers. I was looked after by Bob and Dora Stephens who coached and ran the club. HAS ANY INDIVIDUAL OR GROUP HAD A MARKED INFLUENCE ON YOUR ATTITUDE OR INDIVIDUAL PERFORMANCE? I loved my years with Shettleston Harriers, training with Bob Stephens, fun times going away to British Leagues with older athletes and being part of one big team. Latterly, before moving to Aberdeen, I trained at Coatbridge with Roger Harkins and a group of people who brought out the best in me. They made me train hard and gave me the belief that you can do whatever you put your mind to. This made me even more competitive than I already was. WHAT EXACTLY DO YOU GET OUT OF THE SPORT? Lots of things: discipline, structure, satisfaction. Most of all, fun and enjoyment. I have met lots of friends along the way. It’s funny that we all go along nowadays to competitions to watch our children compete. I still keep trying to get them all back training and joining the Masters’ circuit. They don’t seem too keen. I always remember when I won the Scottish Seniors indoor triple jump title at Kelvin Hall in 1995 and, at the time, set a new Scottish Native record, so that was pretty memorable. More recently must be my performances in 2015. Winning 2 medals at the European Masters and then following it up with a World title was pretty special. I was actually surprised with my distances as I never thought that I would jump that far again. I haven’t jumped that far for over 10 years. The distance ranked me 5th in Scotland. Nice to be competitive with the young ones. YOUR WORST? I don’t really remember anything in particular. However, when I competed for Scotland in Turkey in 1994, I didn’t jump well at all. In fact I jumped further in Lyon last year – that sums up how bad it was. WHAT UNFULFILLED AMBITIONS DO YOU HAVE? When I was younger I was a multi-eventer and moved into 300mH/400mH. I did well in those events and competed for Scottish Schools/Scottish Juniors. Sometimes I feel I had unfinished business at 400mH, but kids came along so I found it easier to stick to triple jump. OTHER LEISURE ACTIVITIES? To be honest I don’t really have the time for much else. I train and compete myself, as well as the kids (Callum 16 and Jane 15) competing too. I am also quite well involved with Aberdeen Athletics Club. I team manage the girls’ side so, from April through to August/September, that takes up most of my time. Breathe, Eat and Sleep Athletics! WHAT DOES THE SPORT BRING YOU THAT YOU WOULD NOT HAVE WANTED TO MISS? Achievements. I can look back and say that I competed for Scotland, held Scottish Records and was a World Champion. CAN YOU GIVE SOME DETAILS OF YOUR TRAINING? I am currently recovering from a knee operation but a typical week in the winter months would be as follows. Mark and I met in May 1994 at a Scottish Senior International in Turkey. Mark was hurdling and I was triple jumping. I always say he fell at my feet as he fell over the last hurdle. Shame though, as that put him out for the rest of the season or I am sure he would have made the 1994 games too. I then moved to Aberdeen in January 1996 and we got married in September that year. All quite quick I suppose. Saved on train fares. We both encouraged each other in our training and it worked well when we started going out. When I came up to Aberdeen I just trained with Bob Masson (Mark’s coach at the time) who already coached Mark’s sister Linda for jumps. Then, when Mark came to Coatbridge, he fitted in well with my training group, as he knew Roger Harkins and Davie Mulheron from Scottish Internationals previously. When I eventually moved to Aberdeen, I just slotted into Bob Masson’s group no problem. My son Callum (16) is an U17 – he is just like Mark, with long legs, so he will be more suited eventually to 400m but is currently sticking to 100m/200m to get him quicker. My daughter Jane (13) is an U15 – she is currently doing multi events but, coming from a gymnastic background, she is already showing signs that hurdles will be her thing. I think I have progressed more in the last couple of years as I started to have a different outlook on my training. I focused more on strength and conditioning. I joined a gym in Aberdeen, called Barry Stephen Personal Training (advert in AAAC yearbook) where I work with Rory Annand, who has helped me get conditioned and able to cope with jumping at my age – ha ha. I still do technical work with Bob.